Water temperatures are holding fairly steady in the Little River area, and inshore water temperatures still range from the upper 40s to lower 50s. The surf is about 54 degrees. Inshore conditions are very clear. 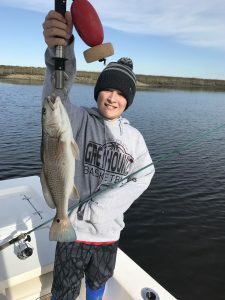 Perhaps due to the fact that water temperatures are essentially unchanged from a few weeks ago, fishing conditions in Little River are very similar to the end of December. 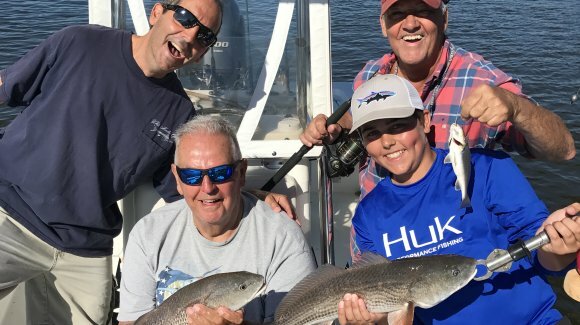 Captain Patrick “Smiley” Kelly (843-361-7445) reports that the bite for trout, red drum and black drum is still pretty good. Plenty of trout can be caught on Mirrolures or Vudu Shrimp fished under a popping cork along ledges in 6-8 feet of water, with moving, higher tides most productive. Redfish have been biting well for a couple of hours before and after low tide, and they are eating Gulp! as well as fresh cut shrimp or cut mullet. Live shrimp are almost impossible to get. They are catching these fish around docks, holes and oyster beds. Black drum are also being caught on shrimp in the same areas on the same tides. Cherry Grove Pier (843-249-1625) reports that the bite is pretty slow, and the main catch is little whiting and croaker.